Need a mushy, kissing-in-the-rain kind of love story to make your holiday travel feel like it’s going by a little faster? Then look no further. 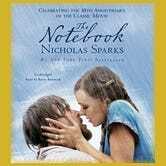 An audiobook version of Nicholas Sparks’ The Notebook is just $4 today.